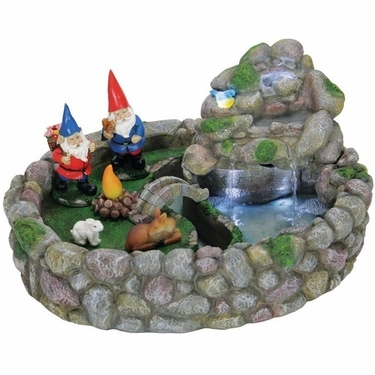 Our brand new Gnome Fountain Kit w/LED Lights will charm and enchant your friends and family during the day and at night. Two, colorful and cute gnomes entertain and warm their animal friends with a campfire in their own rock garden and water oasis. You will love the detail of the pebbled rocks, bright green grass, waterfalls, and sweet-painted animals. At night, you can bask in the glow as the LED lights light up the water, the little bird while you are soothed by the relaxing sounds of the fountain. We know you and your other gnome friends will welcome this new Gnome Fountain with LED Lights from GardenFun into your yard and your hearts. Size: 15" x 12" x9"H, Resin, LED, A/C Power.